It seems that this is a true tough sad week for Egyptians as it started with a horrifying massacre and now they are bidding Farwell to their legendary sweetheart, Shadia. 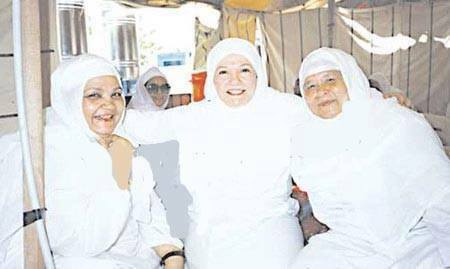 From short time ago, the family of beloved legendary Egyptian star Shadia declared her death after a long struggle with illness in Cairo. Born on 8 February 1931, Fatima Ahmed Kamel Shaker was the youngest daughter of an Egyptian middle-Class family. Her father used to work in the Royal Garden. 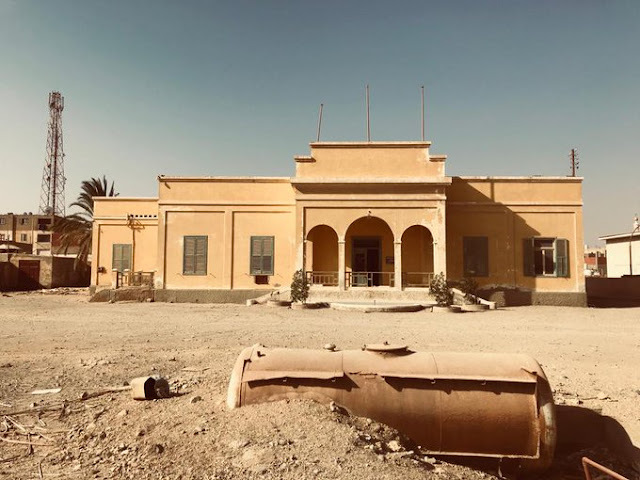 The girl with Turkish roots entered the Showbiz following her elder sister Afaf Shaker whom the critics predicted to be the next big star in Egypt's cinema and theater in their golden age. Ironically, it was young Fatima who became that under the stage name of Shadia. 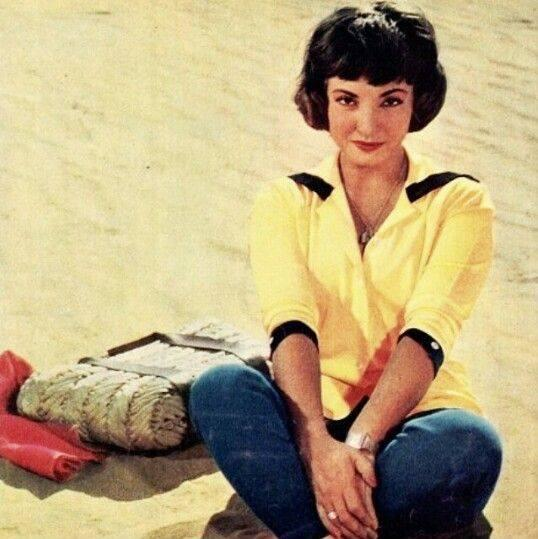 Since the late 1940s till late 1980s, Shadia became one of Egypt’s as well the Arab World’s top divas and stars. As an actor, She is considered one of Egypt’s top artists in the Cinema world. I use the word “artist” because what Shadia presented in cinema is true art. Our critics called Shadia “the Pampered star” of the Egyptian cinema because of bubbly cheeky roles in her beginnings in light romantic comedies but she was for me The woman with thousand faces as one website called her earlier. Starting in 1947, Shadia’s filmography extended for 4 decades becoming a top actor with 114 films. Her filmography started with light comedies then moved to melodramas to romance to musicals. 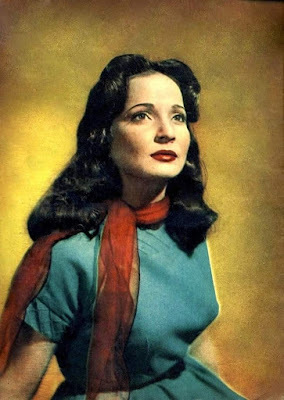 Shadia established herself as a serious actor when she presented the Leading role in “The Unknown Woman” film in 1950 directed by Mahmoud Zulfiqar, which is based upon French play “Madame X”. 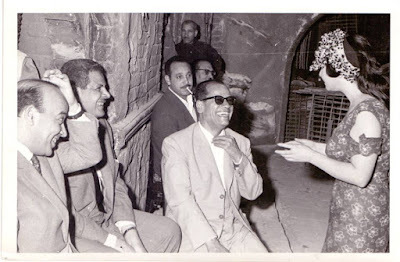 In the 1960s, she presented her best performance in a series of films including films based on novels of Naguib Mahfouz. According to Egypt’s Nobel Prize for literature prize winner, Shadia gave a soul to his women character whether in the “The thief and the dogs-1962”, “Al-Madaq Alley-1963”, “The Road-1964” and “Miramar-1969”. Shadia and Naguib Mahfouz while filming "Al-Madaq alley"
She also presented in 1966 one of Egypt’s most memorable feminist comedy “My Wife is a general manager” along with her husband then Salah Zulficar. 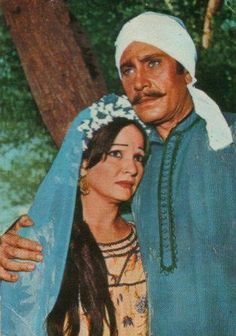 In 1969, she presented one of the greatest role in the Egyptian cinema as Fouada in the political epic “A touch of fear” and since then Fouada became an allegory of Rebellious Egypt standing against that tyranny whom she once loved for the sake of her village. 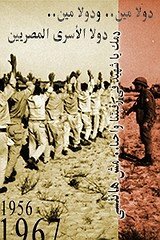 That film directed by Hussein Kamal is considered from the top five films in Egyptian cinema, it is a true piece of art aside from all its politics. As a singer, Shadia also became a top of her generation with her cheerful voice. Just like her acting, her voice and performance got better and amazing as she grew up where you can feel her emotions in the songs. Her greatest songs were composed by Mounir Mourad whom she had a long friendship and as well Baligh Hamdy who was a true music genius. Here is a nice playlist for my favorite Shadia's song , I hope you enjoy them. Her immortal “Ya Habibity Ya Masr” was among the top songs that were sung in Tahrir square. That patriotic song was composed in one day thanks to the music genius Baligh Hamdy. Here is a very rare video for Shadia in the early 1980s speaking about how that song came to the world. In the 1980s, Shadia completely her legendary career by starring in a musical comedy play about Egypt’s notorious serial killer sisters Riya and Sakina along Soheir Al-Bably. 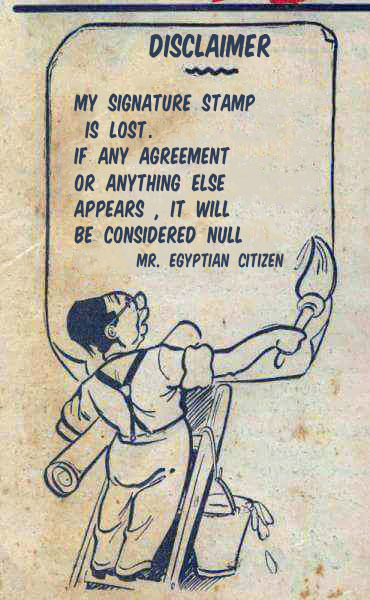 The play was so successful that it toured the Arab world. That play was probably one of the best musical plays in the history of Egyptian theatre. In the late or mid 1980s , Shadia took a decision to quit showbiz and wear a veil spending the rest of her life away from lights dedicating her time to worship God as well helping orphans. She did not reject or regret her work in the showbiz like other actors who quited it in the 1990s denouncing it for religious reason. She was in her 50s when she took that decision that surprised Egypt. 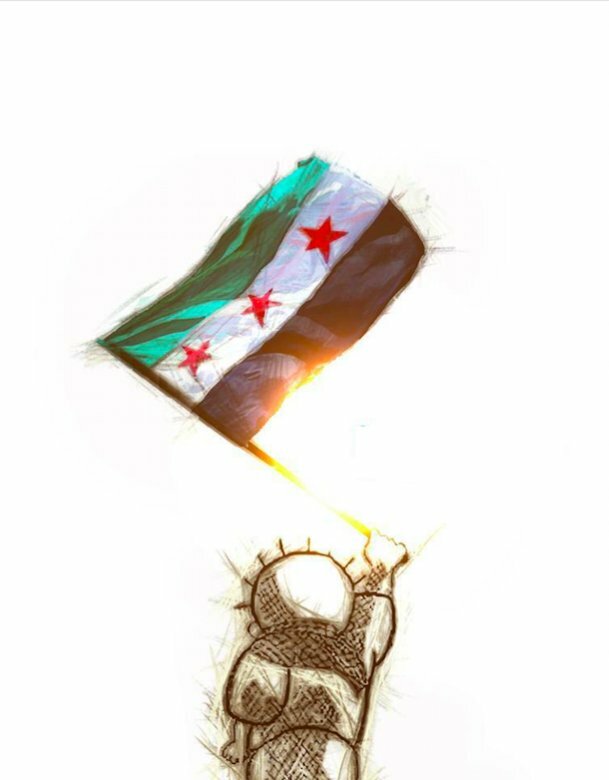 Looking back to her decision and what I knew about her personal life then, I believe that she was so tired and decided to have the rest of her life as Fatima Shaker. 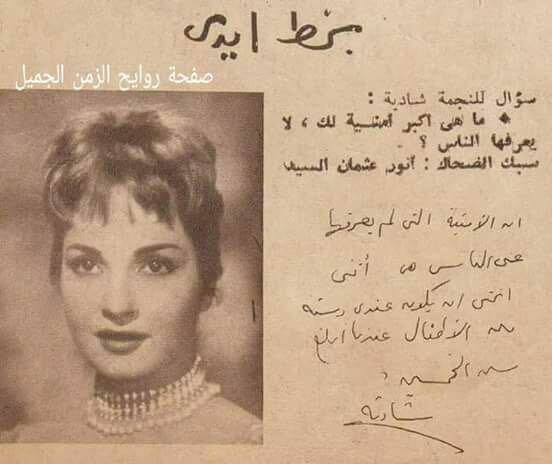 An old magazine showed that Egypt’s sweetheart wished that when she would reach her 50th birthday, she would be married and having lots of kids. Unfortunately, that did not happen. Shadia married officially three times and did not have any kids. She married famous actor Emad Hamdy then Radio engineer Aziz Fathy then Salah Zulficar. Shadia and Zulficar were among the most iconic duets in the Egyptian cinema in the 1960s with their series of films together. Sadly, they divorced later. Nevertheless, she was a true mother to her nieces and nephews like Egyptian painter Nahed Shaker who mourned her as her mother, not as an aunt. Those who met after her decision describe a very sweet, modest and down to earth person. You may not know that but after my graduation from Cairo University, I planned to launch a fan site dedicated to Shadia because I felt the world needs to know about that amazing artist. Unfortunately, I abandoned the project following the death of my grandfather on 8th February 2005, ironically he died on the same day she was born on. I have just read that the moon does not go away, it shines next night until the end of our days on that planet thus is our Shadia. She may have left this world but her work in Cinema and Music will remain forever to remind us of her forever after.